The Evolution of Video Game Music In the early 1970s, video game music wasn't exactly symphonic, but it was effective. Video game composition has become a power unto itself with its ability to guide the player. Now, it's being performed in concert halls by some of the finest orchestras in the world. In May 2004, a composer named Nobuo Uematsu joined the Los Angeles Philharmonic for a single performance of his most famous work. The show sold out in three days. In fact, there was almost a riot at the box office when people couldn't get tickets. What was the music? Uematsu's soundtrack for the popular video game Final Fantasy. In the early 1970s, video game music wasn't exactly symphonic. Case in point: Pong. The players hit a ball back and forth across a center line with that now-recognizable onomatopoeic sound. One of today's top video game music composers, John Wall, spent much of the 1980s pumping quarters into Pac Man machines. "Playing all those arcade games, I never even paid attention to the music," Wall tells host Andrea Seabrook. "It just sounded like sounds to me. However, you know all the tunes. It's so funny. The bleeps and bloops, they kind of invade your brain." It's catchy and it's fun, but it's not exactly serious music. However trivial these early video games' soundtracks may seem, they weren't serious for good reason. And there's a study to prove it. 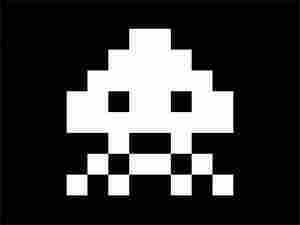 Video game composer Tommy Tallarico explains, "If you remember in Space Invaders, you know, as the ships started to come down, the aliens, and as they got closer and closer, the sound got faster and faster. Now, what the game programmers did was that they took the person's heart rate, and as they're getting closer and closer, people would start to panic. Now they'd do the same studies without the sound, and the people wouldn't panic as much. And it goes to show and prove how significant audio and music are." Like the purpose of all great music, it's supposed to change your heart rate — to move you and make you feel. Video game soundtracks began to take influence from more serious places, like the Russian folk song in Tetris. But still, video game music was limited by its hardware. That changed with the CD-ROM. As personal computers became more agile and more powerful, suddenly the music track could handle something resembling real music. It was 1993's Myst that made Wall realize the power of music in a game. He says the game actually aided the player through the mysterious worlds, functioning as clues. The complexity of the music improved to the point where the score of a video game became almost indistinguishable from the music played in the finest concert halls. Wall went on to score the third and fourth installments of the Myst series, and he based the main theme for Myst III on Karl Orff's Carmina Burana. Tallarico explains that video game music isn't a passive experience, but an integral part of the foreground. "It's for this reason that I've always said that if Beethoven were alive today, he'd be a video game composer." Laughing, concert violinist and self-described "video game addict" Joshua Bell says, "Uh, well, that's quite a statement to say that about Beethoven. I would not go so far." "I have a hard time imagining that," Bell adds. "I mean, Beethoven changed the world as we know it, and I doubt he would have done that through video games. Actually, I think one of the problems with video game music is — at least with film music — yes, you have your restrictions, but of course, video game composers have their restrictions, too. They have to write three minutes here or two minutes there or... with video game music, because it's so interactive, it's actually more of a slave to what happens externally, because one doesn't know what's going to happen in a video game. So for a composer, I would have thought it was quite the opposite." Still, Bell does see the field as becoming "more cinematic and more interesting," and he says he hopes to play on a video game score someday. Concert halls around the country took note, and in 2005, Wall and Tallarico launched Video Games Live. The event features some of the world's finest orchestras performing some of the world's most popular video game music. For the first time in years, professional musicians are receiving the kind of audience energy they've craved. "It's like their field day," Tallarico says. "The one day a year where they can kind of loosen their collars a little bit and have fun. And they're playing to a whole brand-new audience, which is great for everyone."